The recently started blog Converter Passion aims to be a meeting place for professionals with a strong interest in A/D- and D/A-converters. "We haven’t been able to find a similar blog anywhere", says Dr. Bengt Jonsson, founder of ADMS Design and the person behind the blog, "but we believe there’s a need to discuss ADC/DAC-related topics in a less formal and even lighthearted setting". 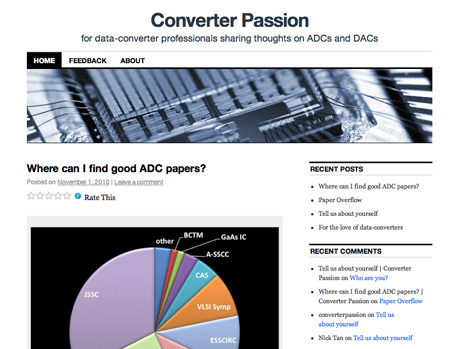 The blog Converter Passion aims to be a meeting place for professionals with a strong interest in A/D- and D/A-converters. "We have found a number of blogs with a much broader scope where ADC/DAC questions tend to become less visible, and we have also found blogs merely repeating press releases from a particular company without allowing visitors to comment. Converter Passion will be very different from that" says Bengt Jonsson. "Exactly how the blog develops will of course be determined to a large degree by the visitors themselves – who they are, what aspects of ADC/DAC they will want to discuss, etc. Just like many other blogs." "Our intention is to share some of the research results from ADMS Design – sometimes results that are directly useful in design projects, sometimes more abstract overviews or theoretical results. We hope visitors will discover Converter Passion as a place where you can get novel and slightly different information that is not really offered anywhere else today." "We also hope that fresh students and engineers, perhaps facing their first ADC/DAC projects, will be able to get help and advice from more senior blog readers. We have opened a dedicated Q&A section where visitors can ask anything ADC/DAC-related, and hopefully get an answer directly in the comments.” Bengt Jonsson highlights that the latter also creates a possibility for ADMS Design to offer some of its competence for free. ”There’s no guarantee that all questions will be answered, but with a bit of luck you can get your problems solved entirely for free, either by us or by someone else."